We have changed the name and logo of our renowned summer intensive because our program’s strength is in catering to the needs of each individual student — as reflected by the (turned-out) “i” in the logo. Our intensive is different, and we hope the new intensive name and logo reflects PDT’s unique roster of summer instructors, small class sizes, and exceptional individual attention in a warm and caring environment. “PDT summer Intensive is result oriented and delivers an outstanding level of training. Not only have my students improved tremendously, my students have received training from the industry’s most sought-after master teachers and guest artists. Mrs Risa Kaplowitz, Director, provides each student a summer Intensive that is of the highest caliber….a marvellous program with complete student immersion, yielding results.” Donna Pidel Artistic Board of Examiners ABT. Director Ballet Conservatoire XIV. Franco De Vita: Co-author of the American Ballet Theatre National Training Curriculum, former director of the JKO School at American Ballet Theatre, recipient of a Lifetime Achievement Award by Dance Teacher Magazine. Unfortunately, Susan Jaffe canceled her trip to Princeton. We are working hard to replace her with a wonderful dancer/instructor. Staff also includes PDT’s exceptional instructors including Risa Kaplowitz, PDT Director, ABT Artistic Board of Examiners, Formerly dancer with Houston Ballet, Dayton Ballet, Ballet Manhattan; Maura Ryan, Associate Director, ABT/NTC Fellow; Nora Cotter, ABT/NTC Fellow; Talin Kenar, ABT/NTC Certified, Formerly of Hong Kong Ballet and American Repertory Ballet; Max Azaro, Ballet Austin Company member; Hillary Pearson, Modern; Lisa Bottalico, Flamenco; Tom McKie, Hip Hop. Limited Class Size To Ensure Personal Attention. Tuition is $2725 for the Summer Intensive Program, ages 11-22. All fees must be paid by May 15th. EARLY BIRD DISCOUNTS: $2600 if registered by February 15 and $2650 if registered by March 15. Audition photos: Head shot and first arabesque 4×6 photos are required. Audition attire: Ladies may wear a leotard in any solid color, pink tights, pink ballet slippers and pointe shoes. Hair should be secured off the face in a neat bun. Men should wear a fitted solid color shirt, solid color tights, white or black ballet slippers. Students who cannot attend a live audition may send in a video audition – see information below. Local students can also arrange an audition class. Financial Aid: While Princeton Dance & Theater Studio does not offer scholarships, many communities do offer arts scholarships for summer study. The following link will take you to one such opportunity: Dance Council Scholarships. GoFundMe pages are also good ways to generate support to further your training. We have three levels. Training includes Ballet, Pointe, Variations, Modern, Choreography, Pilates, Stretch, Flamenco, and Hip Hop. Students have a performance at the end of the session. To audition via video, please download and complete the registration form here. Completed forms, along with a link to your video, can be emailed back to studiomanager@princetondance.com. Payment for the audition can be made via the registration link for Video Auditions at the bottom of this page. Alternatively, the complete form may be mailed, along with your DVD and $25 payment, to Princeton Dance & Theater Studio, 116 Rockingham Row, Princeton, NJ, 08540. Your video should run no longer than fifteen minutes. At the beginning, please clearly state your name, age, and where you currently study. The video should encompass the basic barre elements. Do one side each of pliés, tendus, dégagés, rond de jambe a terre and en l’air, frappés, adagio, and grand battement. Women, please wear pointe shoes in the center. In the center, demonstrate adagio, pirouettes, petit allegro, and grand allegro. Men, please demonstrate battu combination and tours en l’air. Difficulty of combinations while maintaining proper technique will be taken into consideration while evaluating the video. Boarding is in a beautiful 2,400 sq foot house with a community pool. The house is only 10 minutes from the center of Princeton and 15 minutes from the studio. Breakfast and dinner will be provided daily. Students can choose to pack their lunch for the day or buy lunch at the food court next to the studio. 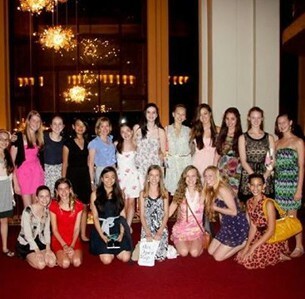 Weekend outings include going to NYC to see ABT’s Sleeping Beauty, beach excursions, movies, the outlets, and more. Boarding fee is $3200. Check in on Sunday, June 23 and check out Friday, July 26. Space is very limited. Supervision will be provided by a wonderful mother of four former and current PDT students. Tuition paid is non-refundable. If a dancer withdraws for any reason, tuition can be held as a credit towards next year’s summer program, but cannot be used towards school year tuition. If you have questions about registration, please contact the office at studiomanager@princetondance.com or call 609-514-1600.